Brittany Coptis is the owner of the local Fit4Mom Fayetteville-Spring Lake chapter. She is a Pennsylvania native and a military spouse who is stationed at Fort Bragg along with her husband and three kids. 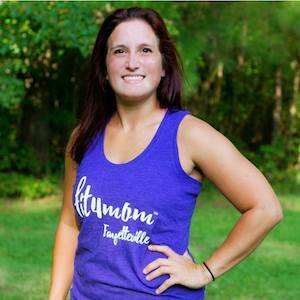 Through Fit4Mom, Brittany is very involved in the local community and helps other moms gain confidence and find empowerment through her fitness programs and classes. 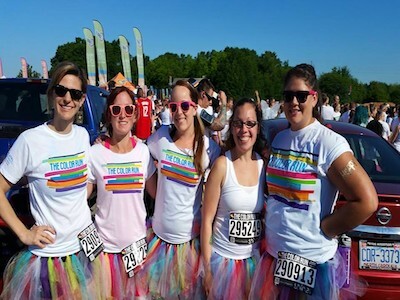 What was your reason for getting involved with Fit4Mom and how did you hear about them? After having my oldest son, Owen 5, I was looking for something to get me out of the house and around other moms. With my husband in the military and being far away from family I felt alone a lot of the time. I came across Fit4Mom through their meet-up website and signed up for my first class not knowing what to expect. I remember the instructor and all the other moms being so unbelievably welcoming and easy to connect with. It was such an amazing experience and I realized how much I really needed a village, this village. What made you decide to become an owner? I hate to sound cliché – but Fit4Mom changed my life. I found who I was as a mother, and being around these women, from all walks of life, really made me a better person/mother. I never really understood the real meaning behind, “it takes a village” until I became a member of this one. I wanted to inspire other women to find their strength in motherhood, and to help give other moms what I had been given. What is your favorite thing about being part of the Fit4Mom community? The Friendships. This group of women never ceases to amaze me. We hold baby sprinkles for our expectant mamas and the kindness and generosity of these women is amazing. I love seeing the friendships develop in class and then carry on outside of class into play dates and coffee dates. They are there for each other if someone’s husband is deployed or if someone needs advice. We bring each other meals after a baby is born or if a mom is having a hard time. Every mom is welcomed with open arms. What does your job with Fit4Mom have in common with being a mom? We are our children’s role models and being a part of this community has allowed me to show my children the importance of working out and living an active, healthy lifestyle. It has made me realize, as a mom, that I need to fill my cup in order to take care of others and I am happier doing it. I can workout with my kids and still get a great workout in. My children also get to interact with other kids their age after class at the playground, during playgroups and various outings. Not only am I building friendships but so are my kids. Besides Fit4Mom, what are you passionate about in the community? Supporting local small business. We try to buy as much as we can through the farmers markets and local shops. We also do community outreach multiple times during the year within Fit4Mom and our Moms on a Mission event. Recently we hosted a school supply drive to donate supplies to local school and those that needed them. Do you have any fitness goals for 2017? I want to personally go through our new Body Back Program! What is your favorite Fit4Mom workout? My favorite Fit4Mom workout is our Stroller Barre workouts. Stroller Barre is our unique blend of ballet, Pilates, and barre – where we use the stroller barre. It has really helped with so many of the alignment issues I dealt with after 3 pregnancies. What is your favorite athletic brand or shoe? Brooks! Their sports bras have been amazing for me.